KitMonsters – Marshall JMP-1. The music makers’ guide to making music. 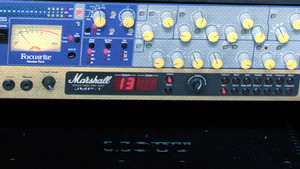 The JMP-1 is a valve MIDI guitar preamp, with a line out for recording. It is popular for rock tone and features four channels, two clean and two overdriven. It is designed to be easy to use for live or recording and also easy to program, with 100 settings available and speaker emulated output. The channel tones range from warm to jangly, metal and high gain aggressive. The JMP-1 has a Stereo FX loop and tone controls include Volume, Gain, Middle, Bass and Presence.